There are few things as enticing as watching a movie with popcorn. At least for me, popcorn completes the experience. Though not much of a movie buff (I am not much of a TV watcher either), I love my popcorn and would probably watch a movie just to eat popcorn! yeah, I know! The crunchy popcorn, when homemade, is a much better and healthier substitute for most of the junk in the market nowadays. I know its tempting to just buy the microwavable popcorn and be done with it. But its pays to be aware that most of such bags are coated with a carcinogen (PFOA). And the contents aren't good either. What should contain only about 2-3 ingredients, in fact has a lot more additives you probably don't care about! 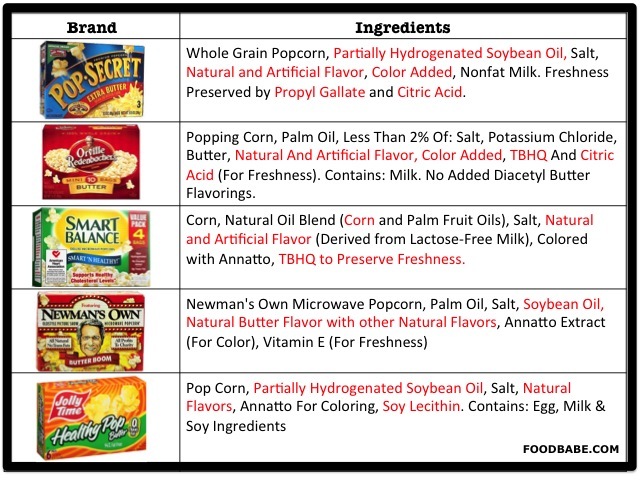 FoodBabe.com has a comprehensive details of such ingredients, if interested. Given, how ridiculously easy and quick it is to make, courting with these unnecessary ingredients doesn't seem worth it to me. You will also find that you even save money making it on your own. That's triple plus. 1. Place the oil, popcorn and salt in a large pan. Make sure the sides of your pan are high to help the popcorn pop. I used a 3qt saucepan. 2. Cover with aluminum foil. Shake it a bit so that the kernels are coated with oil and salt. If you do not have foil, you can cover with a lid which has a vent on top ( or a regular lid but leave it slightly ajar) for the steam to escape. 3. Poke few slits in the top with a knife. 5. and shake it constantly. 7. Switch off flame, remove from the heat (if electric stove) and carefully remove the foil. Stir in any salt that is on the side of the bowl. 8. Slowly drizzle melted butter over the popcorn - you can add up to 2 tbsp for a buttery popcorn. This also helps the salt (and other seasoning that might want to add) to stick well to the popcorn. 9. and give it a shake once again. I have a ceramic top so I just lift the pan and shake every 15 seconds while popping. I use 1 tbs oil for every 2 to 3 tbs of popcorn and sprinkle with cinnamon and salt for a yummy treat and no need for extra butter. My recipe is similar, but with no butter. We use 1/4 to 1/3 cup organic extra virgin coconut oil and 1 cup organic popping corn in a large pot on the stove. After it has popped, transfer the popcorn to a large paper grocery bag and add popcorn salt. It's just regular salt but granulated finer. Shake the bag, close the bag and turn it upside down and shake again to make sure the salt gets on the popcorn. Then you are done. For some reason the coconut oil makes it not need butter and still taste rich and delicious. It's a large batch with a total of about 1200 calories. It will satisfy our family of four, so about 300 calories each if we eat it all, but we often have some left over. I think it is even better the next day. If i have a popcorn popper, can i still put oil ? Will the taste be better? Stove top popcorn has been in my family for a long time. I now pop it in coconut oil, and use the coconut spread with salt to top it. Delish!!!! I can make pie crust and bread (and other things that are supposed to be difficult) in my sleep, but for some reason I could never make stovetop popcorn. So I set out on a mission and am happy to say I have finally mastered popcorn. The method I came up with is different than yours, but I know something different works for everyone. One thing our methods have in common is coconut oil. I had the organic canola oil out when I remembered I had some organic coconut oil, so I gave it a try. I was so surprised that there was no coconut flavor. Good stuff! You can do this in a MICROWAVE too!! :-P Put the kernels in a paper bag, (or a bowl covered with a plate) and microwave for 3 minutes on high or until you can count to 3 between each pop. Then take the popcorn out, put it in a bowl, melt some butter/salt, and drizzle it over your popcorn. Voila! DOne! SO much easier as well! I have a ceramic-top stove. If I constantly shake the pan while it is resting on the stove, it will scratch the ceramic top. May be the pressure cooker is a good alternative. Do I still have to share the cooker? Is the pressure needed or the idea is to keep it closed? I am confused. Could you please tell me when to add seasoning i mean at which step. Where do you get your popcorn kernels from?